Historically, episodes of plague have killed large percentages of human populations. Tens of millions of people have died in Europe due to plague. Plague is caused by the colonization of a mammalian host by the bacterium Yersinia pestis. Yersinia pestis is efficiently transferred between hosts by fleas. Fleas move freely from host to host innoculating each with the bacteria. During the Middle Ages, flea-infested rats often inhabited homes and work sites Any mammal including man can serve as a food source for fleas. Today, wild rodents in some areas of the world continue to be infected with plague. Outbreaks are usually associated with infected rats and rat fleas that live in the home. In the United States, the last urban plague epidemic occurred in Los Angeles in 1924-25. Since then, there have been approximately 10 to 15 persons infected each year, primarily in rural areas. Most human cases in the U.S. occur in northern New Mexico, northern Arizona, and southern Colorado, and in California, southern Oregon and western Nevada. Plague also exists in Africa, Asia, and South America. The World Health Organization reports 1,000 to 3,000 cases of plague each year. Until World War II plague was a naturally occuring disease. The Chinese were the first to experience plague as a biologic weapon. In WWII a Japanese secret project bred human fleas, infected them with the plague and unleashed them on the civilian chinese population in a number of major metropolitan areas. Thousands died and panic resulted just as was intended. Since then, improvements in the dissemination of plague has been studied by a number of countries, including the USA. In 1972 the USA signed the Biological Weapons Convention, vowing never to use biological weapons. Plague is an infectious disease of animals and humans caused by the bacterium Yersinia pestis. The primary reservoir may be soil, where it can persist for years. Burrowing animals may be the first link in the chain of transmission to humans. Humans usually contract plague by being bitten by an infected rodent flea or by handling an infected animal. Droplet transmission and intentional aerosol are additional routes. 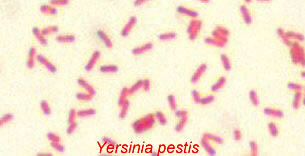 Yersinia pestis is easily destroyed by sunlight and drying. However, when released into air, the bacterium can survive for up to one hour, depending on weather conditions. There are 4 primary forms of plague: bubonic, pharyngeal, pneumonic, and septicemic. Bubonic plague results when Yersinia pestis enters through a break in the skin, e.g., infected flea bites, infected animal bites or scratches, infectious material contact with non-intact skin. Bubonic plague does not spread from person to person. Pharnygeal plague is rare, but has been documented in persons who have consumed both cooked and raw contaminated camel meat. Pneumonic plague occurs when the plague bacterium infects the lungs. This type of plague can spread via an airborne route from animal to person, person to person. Studies indicate that droplet transmission does not usually occur over distances beyond 3.7 feet. However, Yersinia pestis can be intentionally aerosolized, as in a terrorist attack. Untreated pneumonic plague is rapidly fatal. Pneumonic plague may also occur if a person with other forms of plague is not treated and the bacteria spread to the lungs. 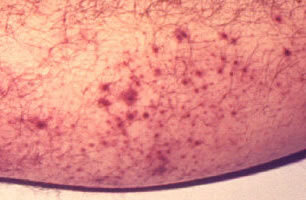 Septicemic plague occurs when plague bacteria multiply in the blood. It can occur as a complication of pneumonic or bubonic plague, or it can occur by itself. Septicemic plague does not spread from person to person. Pneumonic plague can spread from person to person. Patients with bubonic plague develop fever, headache, chills, weakness and swollen tender lymph glands, known as buboes. Buboes are very painful, usually swollen, and often hot-to-the touch. Buboes and a history of exposure to rodents, rodent fleas, wild rabbits, or sick or dead carnivores should lead to suspicion of plague. Onset of bubonic plague is usually 2 to 6 days after a person is exposed. Occasionally, buboes cannot be detected for a day or so after the onset of other symptoms. The disease progresses rapidly and the bacteria can invade the bloodstream, producing severe illness, called plague septicemia. Once a human is infected, a progressive and potentially fatal illness generally results unless specific antibiotic therapy is given. Progression leads to blood infection and, finally, to lung infection. The infection of the lung is termed plague pneumonia, and it can be transmitted to others through the expulsion of infective respiratory droplets by coughing. While bubonic plague is the most common form of the disease in nature, bioterrorists could aerosolize the bacteria to cause pneumonic plague. The incubation period is 1 to 4 days. The first signs of pneumonic plague are fever, headache, weakness, and rapidly developing pneumonia with shortness of breath, cough, hemoptosis and chest pain. The pneumonia progresses for 2 to 4 days and may produce respiratory failure and shock. Without early treatment (24 hours), patients will die. Pneumonic plague is virtually 100% fatal without early antibiosis. The symptoms of septicemic plague are fever, chills, prostration, abdominal pain, shock, and bleeding into the skin and other organs. Patients with septicemic plague do not develop the buboes that characterize bubonic plague. Gangrene for which the "Black Death" was named. Droplet transmission, Droplets are generated during coughing, sneezing, and talking. Droplets do not remain suspended in the air, special air handling and ventilation are not required to prevent droplet transmission. Certain procedures such as suctioning, bronchoscopy, sawing, drilling etc. should be avoided if possible. Respirators and PPEs authorized for use as protection from TB should be used. Antibiotics used as traditional treatment options (eg, streptomycin, tetracycline, chloramphenicol) were less active than ceftriaxone, ciprofloxacin, ofloxacin, and ampicillin, against known variants of Yersinia pestis. Antibiotics must be started ASAP. To prevent death from pneumonic plague they must be started within 24 hours of the first symptoms. Pneumonic plague is highly contagious. Both standard and droplet precautions should be used. Antibiotic therapy for 7 days will likely protect care givers and family who have direct contact with infected patients. In the event of mass exposure, patients should be organized by cohort for isolation and treatment. Patient transport and isolation precautions should be as for TB. A plague vaccine is not currently available for use in the U.S.
Lastly, following an aerosol attack, the disease could persist in locales for long periods by taking residence in the soil and domestic and wild animal populations. Extermination activities may be needed to control vector and disease resevoirs. A licensed Yersinia pestis vaccine does exist and was available in the U.S. until 1999 when the sole manufacturer discontinued production. Other vaccines are available outside the U.S. and research continues on new forms. Plague is a reportable disease. Suspect or confirmed cases must be reported to public health authorities as soon as possible, according to disease-reporting rules within each state or local jurisdiction. The first symptoms of pneumonic plague are fever, weakness, headache, and rapidly developing pneumonia with shortness of breath, cough, hemoptosis and chest pain.